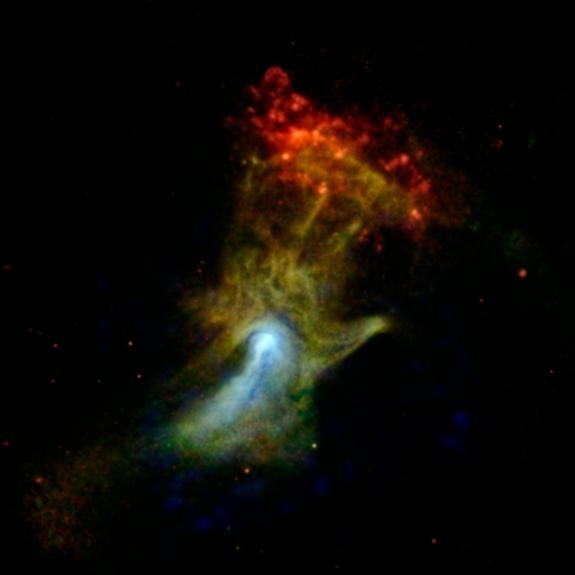 The cosmic “hand of God” photo was produced when a star exploded and ejected an enormous cloud of material, which NASA’s Nuclear Spectroscopic Telescope Array, or NuSTAR, glimpsed in high-energy X-rays, shown in blue in the photo. NASA’s Chandra X-ray Observatory had imaged the green and red parts previously, using lower-energy X-rays. “NuSTAR’s unique viewpoint, in seeing the highest-energy X-rays, is showing us well-studied objects and regions in a whole new light,” NuSTAR telescope principal investigator Fiona Harrison, of the California Institute of Technology in Pasadena, said in a statement. The new image depicts a pulsar wind nebula, produced by the dense remnant of a star that exploded in a supernova. What’s left behind is a pulsar, called PSR B1509-58 (B1509 for short), which spins around 7 times per second blowing a wind of particles into material ejected during the star’s death throes. Scientists aren’t sure whether the ejected material actually assumes the shape of a hand, or whether its interaction with the pulsar’s particles is just making it appear that way. The red cloud appearing at the fingertips is a separate structure called RCW 89. The pulsar’s wind may be heating the cloud to produce the low-energy X-ray glow, astronomers believe. PreviousVegetables Are Not a Crime!